THINGS WE LOVE | Claire, Collected. 1 Comment January 18, 2016 Claire, collected. The time has come, my baby is finally off to nursery school! Ruby has been home by my side for the last two years. I feel so lucky to have had this time one on one with her, I honestly wouldn’t change a thing. It has meant I haven’t had to rush her off to care before she’s been developmentally ready (code red clinger this one), and has also been so great for my other children, getting them easily from school to sports, play dates, home to a home cooked dinner has been an absolute treat for our family after years of both of us juggling full time work as well as the commitments of a young family. Not to say we didn’t enjoy that too, we did! I did, and part of me misses my full time job, the ‘me’ time, the adult conversations, the feeling you get after a big win, a successful presentation, I really loved a lot of aspects about working in an office environment. But I also love this, so much, and honestly we have not looked back, not once. HOWEVER, working from home. woweeeee it’s a thing. A great thing. But also a really hard thing. I only dabble, so at the start it wasn’t so bad, those two long glorious naps each day left a total of up to 5 hours I could work on freelance projects. The second year…not so easy. Shorter naps, and much more interaction required. Gone are the days where Ruby would babble away in a bouncer while I tapped away at emails and editing. All I can say is, GOD BLESS PLAYSCHOOL! ha ha! But what’s that like 25 minutes? Feels like 5! Squeezing 5 hours of work into a half an hour window…not so achievable. Which brings us here! She’s off! In just two short weeks Ruby is starting at the same Nursery School (ELC) that her brother and sister went to when they were her age. For the first 18 months of Ruby’s life she had terrible separation anxiety. Basically wouldn’t go to anyone, like ever. But a few months ago this all changed. She literally just, detached! Miss social at birthday parties, making all the friends at the park, you wouldn’t recognise my once clingy babe in arms. The timing could not have been better. She is so ready. Having waved off and greeted her siblings day in day out for the last 24 months at the classroom door, Ruby is completely clued in to what school is all about. So last week we bustled off to Target to treat her to a few ‘school’ things of her own to get her all excited. She already has a back pack, but we’ve just hit that joyous phase of pink EVERYTHING. It all has to be pink! So that was the first thing she laid eyes on, an all pink back pack in just the right size for a two year old. And as for the rest….. WOWEE did target get this collection right or what? I feel like I should have designed this back to school collection myself. Watermelon errrthang! And pineapple, and banana. I mean how’s that oversized banana pencil case!? Super great quality too. Half of this stuff has already been snuffled by her older sister for her own stationary stash for this year. But at these amazing prices, I think I’ll just grab some more. Our favourite would have to be the Monster Lunch Box sets. Complete with watermelon drink bottles and the perfect sized lunch boxes for little snacks, I had to get one of each colour! Ruby isn’t a sandwich girl, she’s all about the bits and pieces. Cut up fruit and veg, boiled eggs, poached chicken, maybe some rice crackers, cheese, these are her daily staples. So many options to fit these in here, especially love the waste free yoghurt mover. Keeps it cool all day and heaps of room to top with berries. Ruby has used it every day this week just at home! Meanwhile, shhhhh. I so want a watermelon drink bottle for ME! Naturally could not resist a little outfit too, that watermelon tee. I die! So many cute things, the great hard wearing quality we have all come to know and love at Target, combined with these totally on trend styles, we will so be back! Head to your latest target to check out the full range (including all items featured here) in store. 1 Comment January 12, 2016 Claire, collected. What happens when a dance choreographer slash promotions manager slash radio host starts her own fashion label? Enter DOO WOP KIDS! Brand new on the kids fashion scene Doo Wop Kids encapsulate childhood in a nutshell. Fun and comfortable without sacrificing style, one word springs to mind. These kids are COOL! And let’s be real, they had me at POM POM SOCKIES!!!!! The second our goodies arrived I was all inspired to get started on a little craft project. With Doo Wop designs in mind Ruby and I got busy decorating her a DIY cardboard cubby house. I painted one side, she did the other. The crazy messy fun we had! Ruby mayyyybe ended up looking more like a jelly wrestler in training… not sure what got more paint, the craft house, or Ruby! But that’s what it’s all about right? Just like Doo Wop Kids. The essence of this brand is fun fun fun, down to every last polka dot, every last squiggle. 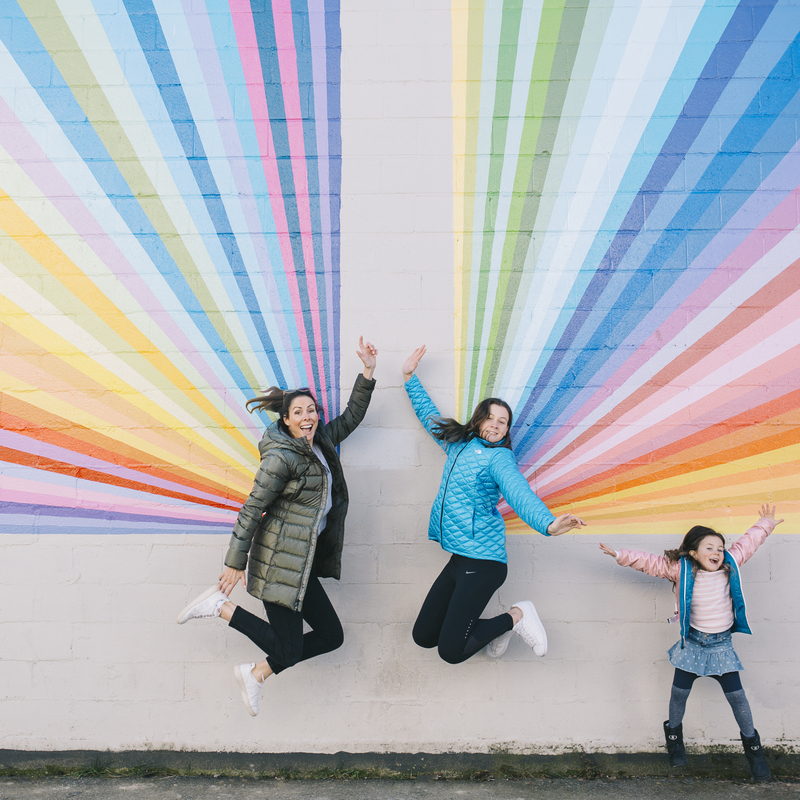 Behind the scenes outtakes blog post on our crafty fun to follow, but for the meantime, you can check out the awesome Doo Wop Kids fashion range: HERE. 4 Comments December 20, 2015 Claire, collected. Soaring temperatures in South Australia for the first week of school holidays has ensured a heavy schedule of beach / pool alternation for the last seven days straight. There is nothing my girls love more than exploring new jetty’s, chatting to the fishermen, and of course the swimming, ice-cream and copious amounts of fish and chips that go hand in hand with our endless beach outings. Summer you are most definitely our favourite! The new range of clothes from Alfie Apparel featuring ‘Coney Island’ could not be more perfect for us. Fun designs, easy wearing, can we even handle Ruby in that jumpsuit! All sorts of Flashdance vibes spring to mind! Teamed with their absolute FAVE retro Skipping Girl bags. Stuffed to the brim these bags go everywhere, EVERYWHERE with these two. And admittedly, so does mine. Nothing like a bit of old school fruity fun.